Summer in Oklahoma Pocket Letter – Welcome! Popping in for a quick post about my Twinchie Pocket letter. Over on the One Journey Coaches Challenge Group on Facebook they post a weekly challenge. At the beginning of August, they posted one for a Pocket Letter & I decided it would be fun to play along. A pocket letter is a creation of small works of art based on the multi-pocket album pages. 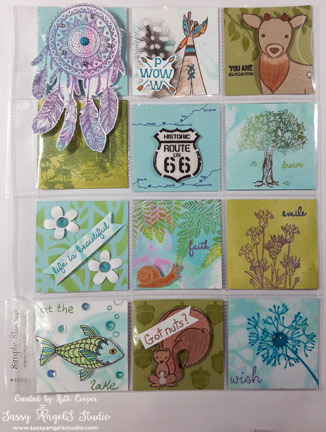 We used the 12 pocket 2 inch by 2 inch page to create a summer themed pocket letter that fits our Journey Days Albums created by Webster’s Pages exclusively for Fun Stampers Journey. Since we usually do not travel during the summer months, I did mine based on our Oklahoma summer right here at home. We moved to 2 wooded acres in the country last year, around the corner from Lake Thunderbird. We have deer, squirrels, possum, every once in a while we sight a coyote or fox & there are lots of trees, it’s wonderful. The deer come right up into our yard to feed & camp out at night. With acorn & black walnut trees the squirrel are plentiful & our dog Reilly is always on watch for them. It wouldn’t be summer in Oklahoma without some Native American festivities or maybe a ride down Route 66. I used quite a variety of our products on these small masterpieces including some of my recent marbling play with our silks, along with stamps, stencils and accessories. It really was fun to dig through all my FSJ stamp sets to see what would fit the theme. This will make my 124th day of sharing artwork over on my Facebook business page. Have a Fabulous & Creative Labor Day Weekend! I know I will be in studio creating for September’s classes.